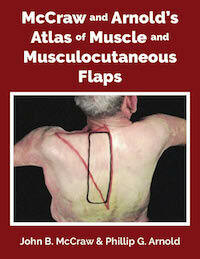 Originally published by Hampton Press Publishing Company in 1986, "McCraw & Arnold's Atlas Of Muscle And Musculocutaneous Flaps" is a full-color volume showing the reconstructive options for specific anatomical areas. Each flap is demonstrated in cadaver dissection and clinical case photographs, and the text is in an easy-to-read outline format to serve as a ready reference for the anatomical basis and clinical application of each flap. Highlights are the full-color photographs and the extensive bibliographies. Thanks to Interplast for working with Global HELP in reproducing this book for posterity.